Quanah Parker was chief of the Quahada Comanches. He was the oldest son of Cynthia Ann Parker, who was abducted by Comanches when she was 9 years old. He was the most celebrated Comanche chief of all time. The name Quanah meant odor or perfume because he was born among the flowers on the prairie. The Comanche and confederated tribes had in the past camped in the Palo Duro Canyon. In 1878 Quanah and Charles Goodnight met in the Canyon to agree on a treaty stating that the band of renegade Indians with Quanah would stop killing the JA Ranch cattle. In return Charles, the ranch manager, offered 2 beeves (cattle) every other day until they could find buffalo for meat. Quanah was born in 1845 and died Feb 23, 1911 in Cache, Oklahoma. Originally I had Quanah on a dark horse but read later that his favorite horse was white. 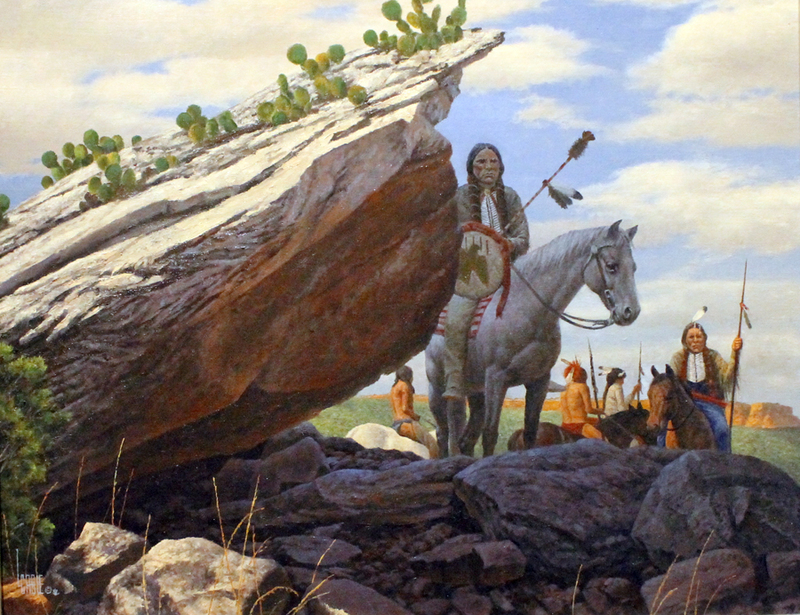 I moved Quanah closer to the boulder to unify the two elements. 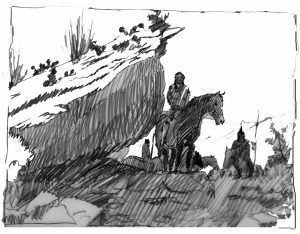 I also made him and his horse larger to bring him closer to the foreground. This allowed me to put more detail in his face. I added more braves for interest and the canyon walls for more depth and a place for the boulder in its true environment. The lance was added last to draw more attention to Quanah and to give him warrior status.